Typically when I use wire for my kumihimo work, I use 20 gauge plated copper. If you are familiar with wire and done any work with it you know that 20 gauge is right on the edge of the readily finger malleable gauges. Getting ‘perfect’ tension with this gauge is always a challenge and you must be ready to show the wire (after acknowledging it superiority) who really is the boss! On a traditional maru dai shorter lengths can be mastered. For longer pieces, however, the need to readjust the counterweight often leads to unwanted bends in the wires or a misaligned braid and always a few tension issues. 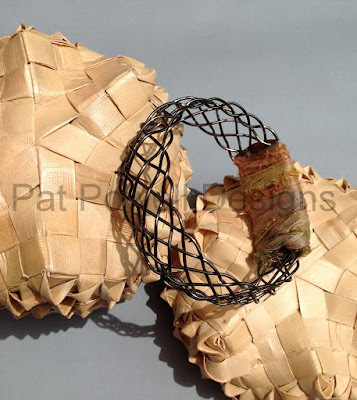 A solution presented to our local weaving group a few months ago for another problem led me to my solution. I just needed a much taller mau dai with a few added features and I was on my way. I am very pleased with the braids shown. The tension in both comes close to rivaling braids of silk. P.S. These braids are in the Member’s exhibit at the Contemporary Handweavers of Texas (www.weavetexas.org) June 2nd thru June 4th at the Sugar Land Marriott hotel. I do enjoy making these neck pieces out of wire, especially 20 gauge. The available wire colors are a joy to work with. Unfortunately, the photo doesn’t show there is a steely bronze colored wire along with the blue. I think adding the additional color adds depth to the color of the overall piece. 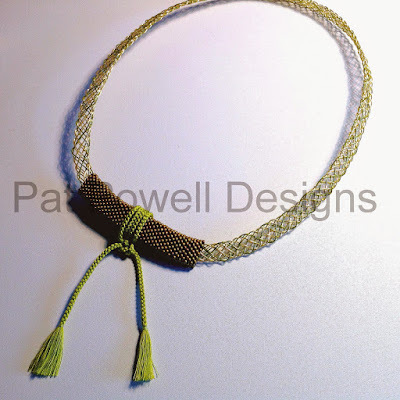 One of the challenges I have had since I’ve started using wire is to be able to create a braid with 18 gauge wire. I do have a difficult enough time managing the tension using 20 gauge but the 18 gauge always eluded me. As I was going through one of my books, however, I spotted a structure that might help me overcome my problem. This is my first semi-success with 18 gauge wire. Now that I have created a braid with it I think I’ll put that challenge aside. 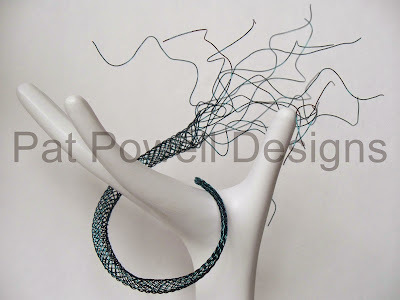 Have spent some time on a new wire kumihimo design. I think I like this one. It is done with 2 colors of 20 gauge wire. It easily slips on and lays very nicely. Time to make a couple more. I ordered some new wire colors and am anxious to see how they look. 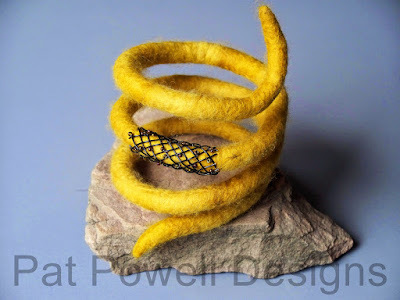 Thought I would try to add a band of kumihimo to a felt cuff. Used the same structure as Kumihimo Concept and braided a short tube of wire. The length of the tube I had made was too long for how I wanted it placed. So I kept snipping it shorter until it seemed to be the correct size. As there was nothing to keep the tube from unraveling, it needed to be tacked in place. Used a few beads while I did that. An interesting look. If I do this again the next tube should probably be the length of one wrap. 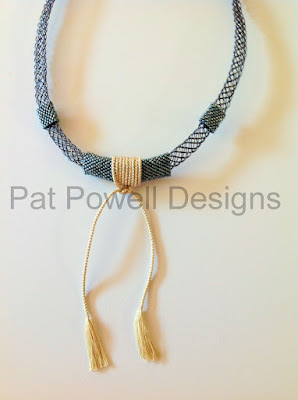 As I was looking through a book of beautifully created neckwear, I ran across a piece that looked as though it was made with a kumihimo technique using wire. All the photographs in the book identified the materials used in these pieces but not the technique. While I have been doing wire pieces for a while, I hadn’t done anything using the structure shown. I decided a bracelet would be an interesting piece to try. After making my bracelet I determined the gauge of wire used in the neckpiece was a bit thinner but for a bracelet, heavier is better. The braid structure appears, however, to be identical. This convinced me that the piece in the book was indeed done using a kumihimo technique. Now my challenge will be to make a bracelet that is wearable. This one will sit on the wrist and, as long as there is no movement, it stays there. Since we all move around, however, that challenge needs to be addressed. Will post my results.